Engaging children and young people as co-creators of health together with the social, education and health sectors was a common theme on the first day of the high-level conference “Promoting intersectoral and interagency action for health and well-being in the WHO European Region”. The conference is held in Paris, and hosted by the Ministry of Social Affairs and Health of France. Opening the conference, Dr Piroska Östlin, Director of the Division of Policy and Governance for Health and Well-being at WHO/Europe, underlined that inequalities for children cannot be tolerated, and that addressing them is at the heart of the European health policy framework Health 2020 as well as the 2030 Agenda for Sustainable Development. Following Dr Östlin’s introduction, Dr Benoît Vallet, Director General for Health at the Ministry of Social Affairs and Health of France, welcomed the 270 delegates from over 40 Member States to the conference. They included representatives of the European Commission, the International Labour Organization (ILO), the Organisation for Economic Co-operation and Development (OECD), the United Nations Children’s Fund (UNICEF), the United Nations Development Programme, the United Nations Educational, Scientific and Cultural Organization (UNESCO), the United Nations Population Fund (UNFPA) and the World Bank. 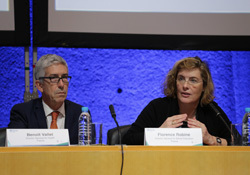 Dr Vallet highlighted the aims of the next 2 days: to promote and strengthen the sharing of good practices, to apply intersectoral approaches, and to reach consensus on working collaboratively across the health, social and education sectors to reduce inequalities among children and adolescents. Ms Florence Robine, Director General for School Education at France’s Ministry of National Education, recognized the symbolism of holding the meeting at UNESCO, which places education at the heart of its work, and underlined the important contribution that education makes to addressing poverty, development, health and peace. Ms Robine noted that government sectors and partners must implement measures that are internally consistent, complementary and “one step ahead” for joint health, education and social policy. In her opening address, Dr Zsuzsanna Jakab, WHO Regional Director for Europe, explained that the conference is part of an ongoing regional dialogue that brings together partners, multiple sectors and diverse areas of government. “The evidence is clear: giving children a good start in life is essential to generate dividends for the well-being, development, sustainability and resilience of today’s society and for future generations. The evidence is equally clear that social determinants of health, social inequalities and social protection have to be addressed more vigorously – in order to leave no one behind,” she said. Mr Heinz Koller, Regional Director of the ILO, emphasized the need to address the global shortfall of 10 million health workers in order to move towards universal health coverage – a key element of the sustainable development agenda. He noted that creating decent jobs in the health economy is an investment, and part of inclusive growth. Ms Alanna Armitage, Regional Director for Eastern Europe and Central Asia of the UNFPA, explained that people need strengthened literacy skills and the ability to make healthy choices, and that school settings are often the first point of contact for young people in this regard. She underlined that early pregnancy represents a risk for dropping out of education, thus perpetuating inequalities across generations. Ms Armitage noted the timeliness of the conference, and reiterated the UNFPA’s commitment to work with other sectors to promote the health and well-being of children and adolescents. Describing the decades-long collaboration between WHO and UNESCO, Ms Soo-Hyang Choi, Director of UNESCO’s Division of Inclusion, Peace and Sustainable Development, highlighted that health promotion in schools is a focus area in the forthcoming memorandum of understanding between the 2 organizations. Professor Sir Michael Marmot began his keynote presentation with the question: “Why treat people and then send them back to the conditions that made them sick?” He shared several examples of how the social and economic circumstances of young people’s lives affect their health, and the reasons behind this. Professor Marmot highlighted the connection between disempowerment and premature death from causes such as drug and alcohol poisoning, suicide, alcoholic liver disease and violence. He also underlined that adverse childhood experiences have long-term health consequences that affect society along the social gradient. According to Professor Marmot, fiscal policy – social transfers – that reduce societal inequalities and deprivation contribute to reducing health inequalities. Mr Mark Pearson, Deputy Director of Employment, Labour and Social Affairs of the OECD, considered the challenge from the other side, providing evidence on how health affects the social and economic environment. He explained that poor health is the best predictor for young people not in employment, education or training. He appealed to policy-makers across the health, education and social sectors to place a particular focus on adolescents and young people during the 5- to 10-year window of opportunity after their compulsory schooling ends to help them enter a stable career. Evidence shows that it is extremely difficult to move into meaningful employment after this time. Reflecting on the scientific preparation for the conference, Dr Didier Jourdan, Professor at Blaise Pascal University, France, and Co-chair of the scientific committee, noted the need for more evaluative data on the effects of policies to address inequalities, rather than more observational data on the existence of inequalities. He raised the issue of scaling policies up from local to national levels, and pointed out that collaboration on data should be strengthened across disciplines, institutions and international networks. A panel discussion of representatives of Member States, United Nations partners and civil society raised key themes, including the role of private companies in promoting unhealthy food; the association between cyberbullying and increased alcohol and drug abuse in young people; prioritizing the prevention of violence against children; partnering with civil society; the need to work in collaboration with vulnerable communities through co-production and co-ownership of policies; how to ensure that children participate in the development and implementation of policy agendas; balancing short-term needs with the needs of future generations; and taking account of the informal sector, particularly in middle-income countries. Dr Martin McKee, Professor of European Public Health at the London School of Hygiene and Tropical Medicine, United Kingdom, began his keynote address on social protection floors – the provision of essential health care and income support for all in need – by noting that 20% of children in wealthy countries, and up to 50% of children in other countries in the Region, are currently at risk of social exclusion. Professor McKee described how the circumstances in which people live have changed: many experience a state of precariousness in terms of livelihoods, personal security, the environment and global politics. He also provided examples of how social protection policies can affect mental health – positively through the provision of a minimum wage, for example, or negatively through the cutting of housing benefits. To conclude, Professor McKee called on governments, civil society and academia to make timely and appropriate data available, particularly on vulnerable groups; create mechanisms for accountability; give people hope in terms of employment, housing and food; and invest in the health and well-being of young people. Mr Bernd Neuendorf, State Secretary of the Department of Family, Children, Youth, Culture and Sport in North Rhine-Westphalia, Germany, provided an example of social protection policies at the subnational level. He described the “prevention chains” developed and co-funded in different communities in the region to provide individual and contextual care from before birth until entrance into working life. He underlined that these chains require backing by council leaders and must be based on strategic guidance from neighbourhood data. He also noted that the services must be provided in places where children and parents are, such as schools and council offices. Panellists in the subsequent discussion raised many issues, including the particular vulnerability of children and their lack of rights; higher public expenditure on social security as an investment that contributes to an individual’s independence across the life-course; the fact that while almost all European Union (EU) Member States have a guaranteed minimum income, only a handful meet the EU-recommended level; and the need to give children and young people a voice, ensuring that they can participate, speak about their challenges and develop solutions together. Many agreed on the benefits of social protection policies that follow the progressive/targeted universalism model – providing benefits for all, with a little more for those most in need – as it contributes to social cohesion and avoids stigmatization. Panellists also expressed a sense of urgency to provide social protection measures, noting that right now many people are being left behind. Ms Florence Robine and Dr Benoît Vallet gave a joint presentation on how France’s Ministry of National Education and Ministry of Social Affairs and Health have been working together to build intersectoral policy on education and health. They explained that a new convention on public health partnership, signed on 29 November 2016, focuses on the most vulnerable young people from age 3 and equips professionals with tools to assist them. The convention seeks to improve children’s knowledge and empower them to be responsible agents in their own health and the health of others, and to improve continuity between schools and communities. It places an emphasis on civic education for children and teenagers, and the creation of positive school environments. Comments made during the session’s panel discussion focused on the importance of creating a common platform to enable cooperation between ministries; Scotland’s approach to supporting young people during the challenging transition out of school, which involves not allowing pupils to leave without a “destination” such as an apprenticeship or further education; and the fact that schools have multiple agendas, but that other sectors should ask how best to work together. Several of the final comments of the day stressed that sustainable change is only possible through the involvement of young people and working with them as part of the solution. Evidence shows that the number of unaccompanied minors (UAMs) arriving to Europe has greatly increased in recent years; 88 300 UAMs applied for international protection in the EU in 2015, compared to approximately 23 000 in 2014 and 13 000 in 2013. The technical briefing focused on the implications of this dramatic increase for the health, social and education sectors. Delegates from Greece and Italy – 2 countries on the frontlines of the migration crisis – shared country perspectives. Panellists from UNICEF, Médecins du Monde and academia provided additional viewpoints on how sectors can work together to ensure the health and well-being of this vulnerable group. A side event addressed the intrinsic relation between water, sanitation and hygiene (WASH), health and education and how this is anchored in global and regional agendas. Access to WASH is still a barrier for many children and adolescents, which negatively impacts school attendance – particularly for girls during menstruation. The event focused on the need for successful cooperation between sectors, and the importance of the education sector playing a lead role in working towards good health and good learning for all children. Delegates from Hungary, Kyrgyzstan and Scotland shared country experiences, and a WASH expert and a youth representative contributed key perspectives.